Have you got any unmet goals you’ve been working on for years? You know the type. Ideas swirling around your brain that you’ve worked out in great detail, over and over a million times in your imagination, but never quite got past the vision stage. I’ve got one of those and you may be able to help me bring it to fruition. For several years now I’ve been thinking about creating products for the home with my preferred French style in mind. 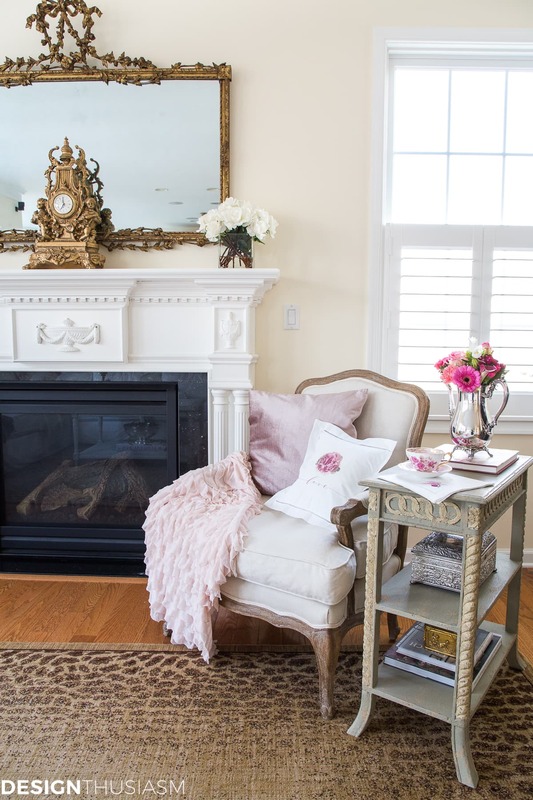 When I shop for certain things like decorative pillow covers and more, I find it difficult to find just the right imagery that would work with my home. I know what I’m looking for, but I don’t see much with the right delicate touch or refined approach. 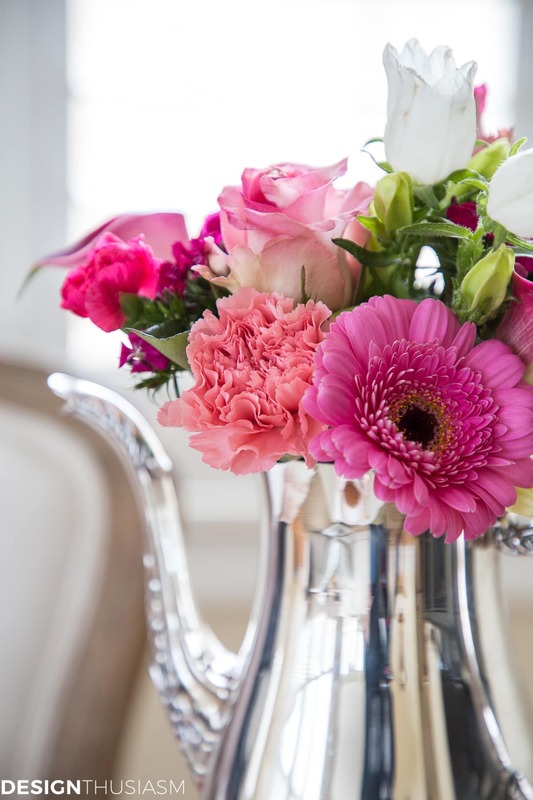 I enjoy having flowers in my home and aim to keep fresh ones in vases and containers all the time. But when it comes to floral prints, I try very hard to use a soft modern look. No huge over-the-top florals for me at this time because right now they’re feeling dated. 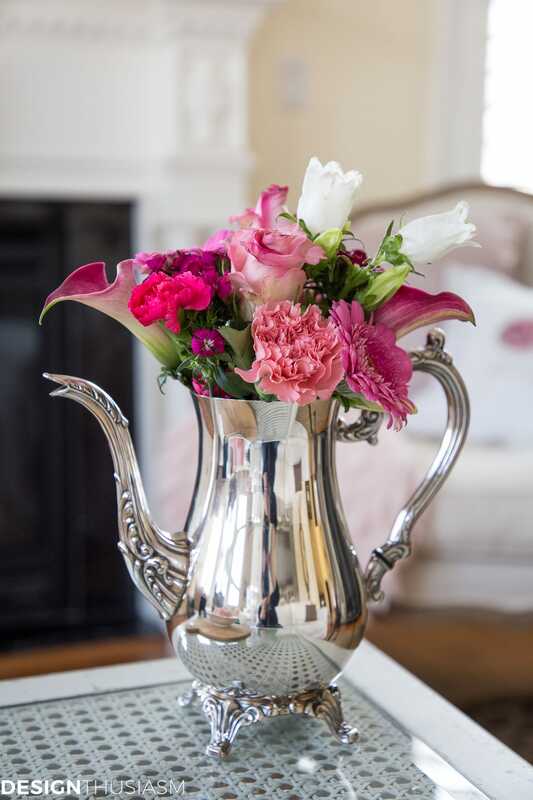 But oh how I love a lovely bloom presented on fine linen with a sweet simple message! Because I couldn’t find one to buy. My graphic style is inspired by companies like D. Porthault and Fragonard of Paris. It feels French to me and a bit timeless. I started with a beautiful 12” square white linen pillow with hemstitch edging and a custom polyfil insert. The quality is lovely and quite unlike the common polyester pillows you find all over the web. 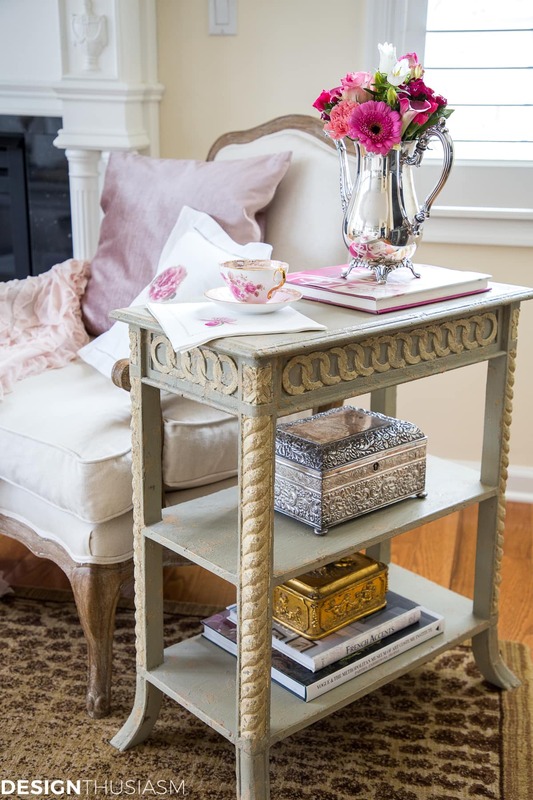 You can see the Frangonard napkin that inspired this look above, placed under the teacup. It, too, has hemstitch edging and a delicate floral image. I bought it in France years ago and it’s part of my favorite napkin set. Whenever I see it, it takes me back to that beautiful French town and reminds me of a gentler way of life. One of the small pleasures I often talk about and value so much. My modern French style borrows heavily from classic French Country, but it’s informed by a current and decidedly American lifestyle. I use a lot of whites and a clean uncluttered approach with lots of open space and a clear focus on what I find pretty. And this is exactly how I approach my graphics as well. Clean. Simple. Uncluttered. Pretty. What do you guys think? Would you be interested in me creating home products like the pillow above? It would be priced in the $29-$39 range. Besides decorative pillow covers, I might add napkins, table runners, linen coasters and tea towels. 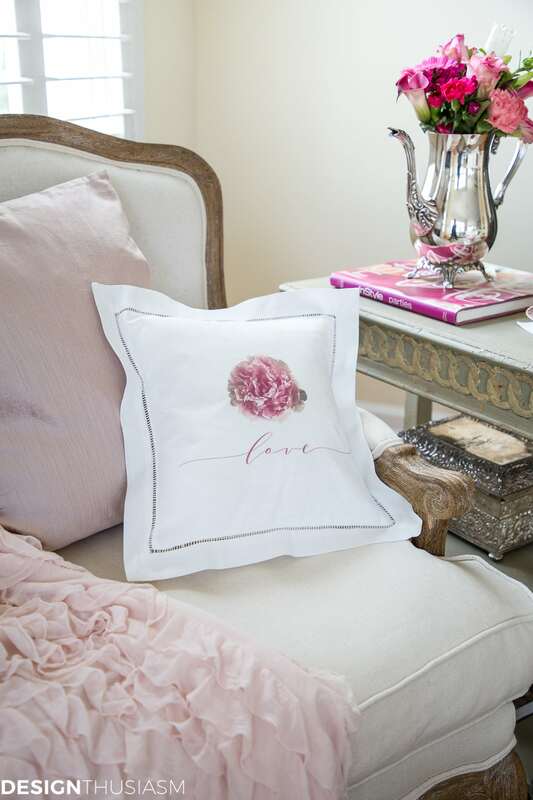 I would start with this Valentine’s influenced “Peony Love” pillow and add styles seasonally or as inspiration strikes. Spring flowers, Easter imagery, fall and Christmas, too. I would even consider special order pillows for baby gifts and more. Before I invest in inventory, I need your feedback. You are my people, the ones who share my taste and style. If you guys are interested, I’m ready to move ahead. Right now I can fill orders on the “Peony Love” pillow on a made to order basis, so delivery would take about 2 weeks. I’m offering it to my readers for the introductory price of $29.99. You can click HERE TO PURCHASE from the first offering from my online shop. If enough interest is there, I’ll expand my Designthusiasm Shop. And now it’s your turn to tell me about your dream. What goal have you been working towards or thinking about for years? Perhaps I can inspire you to realize it like my prospective little online shop! Click on the items below for direct links to the products. Where actual items were no longer available, I’ve provided similar options. I am such a “linen fairy”. I would love to see you do this. You have impeccable taste and design knowledge. I know anything you design will be lovely. Yes, sooo interested!!! I love. Thank you! It’s a go!! You’ve sparked my interest ! I agree w all the ladies above. Go for it! Consider it done! Just need to work out the technical issues (but first need to fill the current orders on this pillow… :-)). Yes please! I love the look and as you mentioned the quality of fabric and design is so difficult to find in today’s market place. Thank you and I do think that’s true. Be on the lookout as I work out the details of the shop. Meanwhile this one pillow is available for order. That’s awesome, Jan!! Currently the Love pillow is available for immediate order, but I’ll be doing new options for spring, and then regularly henceforth. I’ve been overwhelmed by the response! Love it. Think this would be a great idea and I would be happy to purchase this pillows and other designs. Absolutely yes! I’m a textile junkie and your taste is fabulous! Will order 2 right now! Plus whatever else you do. I would love Napkins like this!!! And next I’ll be setting up the actual shop which will include the related styles (napkins, etc), as well as new graphics for spring. 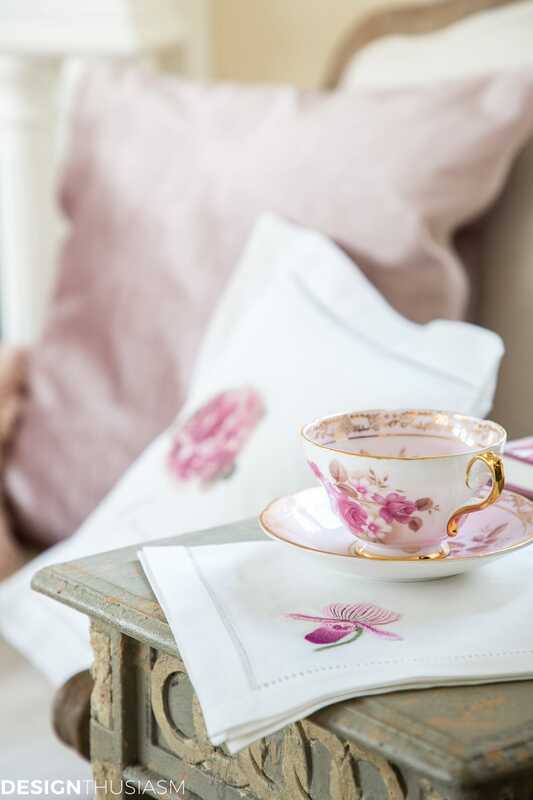 I love the hemstitch pillow cover and simplicity…BUT…I do not like the flat printed floral, it seems cheap (sorry) If it were a raised embroidery design, such as the napkin looks to be, I would buy more than one, such as seasonal. 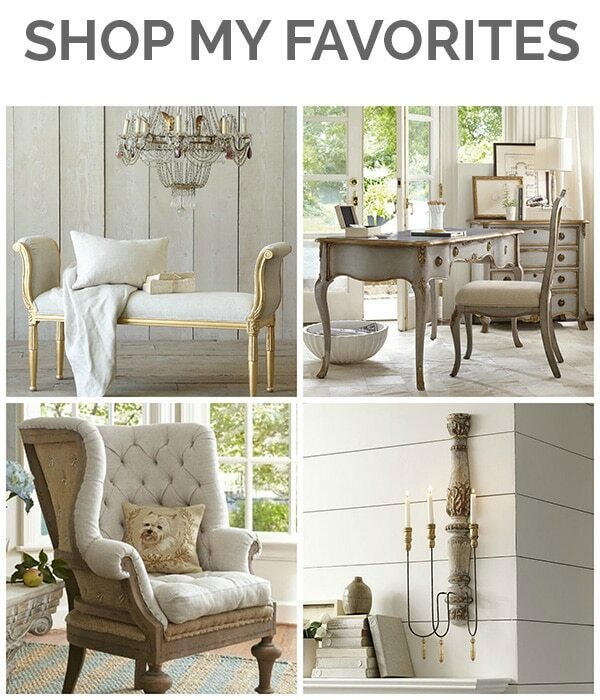 Also, Do love white but my whole house is mostly ivory and cream tones so some items for those people would be nice. I don’t do many pinks etc but greens, french blues, fall colors for autumn and even some black touches would be lovely. Thanks for the feedback, Jillian! I don’t have the capability to do embroidery at this time, but will keep it in mind for the future. Likewise, I’ve yet to find pillows in the cream color, but I will certainly be on the lookout for them… 🙂 This is all new, so will take some time to develop. I’d be interested in the tea towels and napkins for sure! That’s wonderful! Stay tuned, as they will definitely be coming!! Lory, I would be soooo happy to see your lovely creativity come into play with linens. 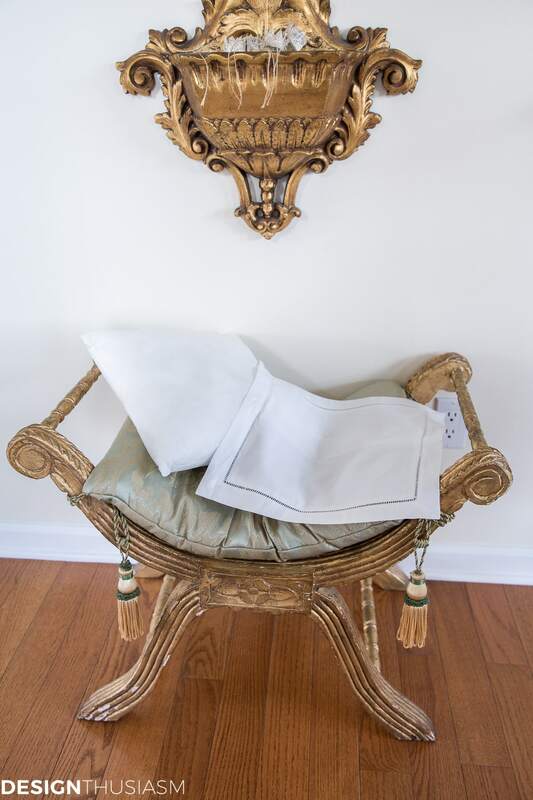 I am a pillow fanatic, but have a hard time finding pillows that I truly feel are classically elegant. My “fox hunt” room has been the easiest because I know of several great companies that sell wonderful needlepoints (expensive, but they last forever). It would be wonderful to see Holiday and seasonal linens with interesting graphics. 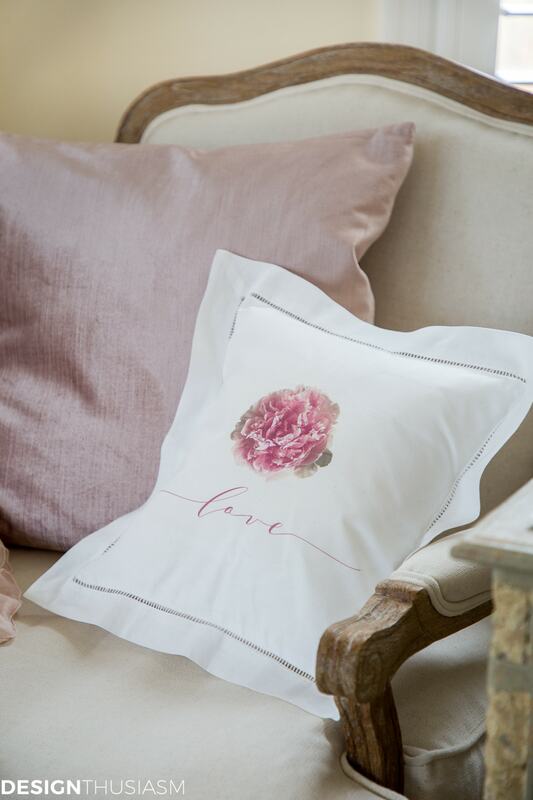 Your “love” pillow is very pretty, but I think I would prefer it to have an embroidered flower as I am not one who cares for flat prints (but, that’s just me). Best of luck to you in this exciting new adventure! Hugs! Thank you, Bobbi! While the response has been overwhelming, there was one other person who mentioned embroidery. I’m not set up to do that at this time, but I could look into it down the road. Obviously it would be significantly more expensive, but I’ll give it a look. Yes, what a beautiful pillow! The pillows are very pretty! Simple and love the linen look. I think you will do well, since they are simple and go with everything. 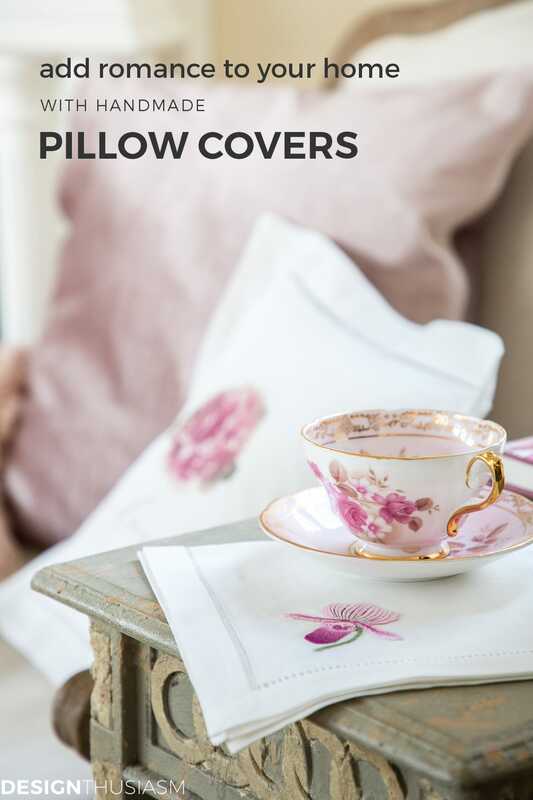 Would like to add that being able to buy covers only would be a bonus as I am getting so many pillows to store. Pretty soon hope to find time to get rid of many inserts and keep a few for easy storage. That’s good to hear… 🙂 I will likely offer the inserts as an option, as the pillow is small and many people may not have that size insert. But others, like you, may prefer just the cover. I would love to receive info on purchasing the pillow cover. Thanks. That’s terrific, Carolyn! I’ve set up a temporary order form until I can get the shop completed, so you can order it here: https://goo.gl/forms/VOa7bEB9AOidthKw2 Thank you so much for your interest!! I will be ordering your peony pillow cover! I think it would be the perfect touch in my master BR done in gray and white with blush and copper accents. You have such a flair for color and design. Excited about your new adventure!! Thanks, Fran! It does sound like great for indeed!! I’m sure you’d have customers for these. With your wealth of exposure to fashion and design and vintage textiles you will never run out of ideas. Can you explain the difference between that hemstitch hem and fagotting please? Thank you. What a pretty pillow you should definitely sell them! Thank you for sharing on Merry Monday! Hope to see ya next week! Good Morning… pillow cover ‘love’ is ordered from you…! Can’t wait !! Blush pillow from West Elm… on its way !! NOW I just have to get the new couch !! LoL. A.N.D. being able to shop from YOUR store would be fantastic. !! Haha! Working on it… 🙂 Thank you so much for your order and your vote of confidence!! Beautiful pillow. If it were only a sunflower…. but maybe you would do one in the future, I would be your first happy customer to buy one! Your style is wonderful, go for the whole line, you can’t miss with your classic beauty in designing for the home! I will be waiting for the sunflower design to come out! Thank you so much!! And yes, maybe a sunflower for summer… 🙂 Working on the tech aspects of the shop first. Once I have that squared away, I’ll happily fill it with products! Beautiful post! 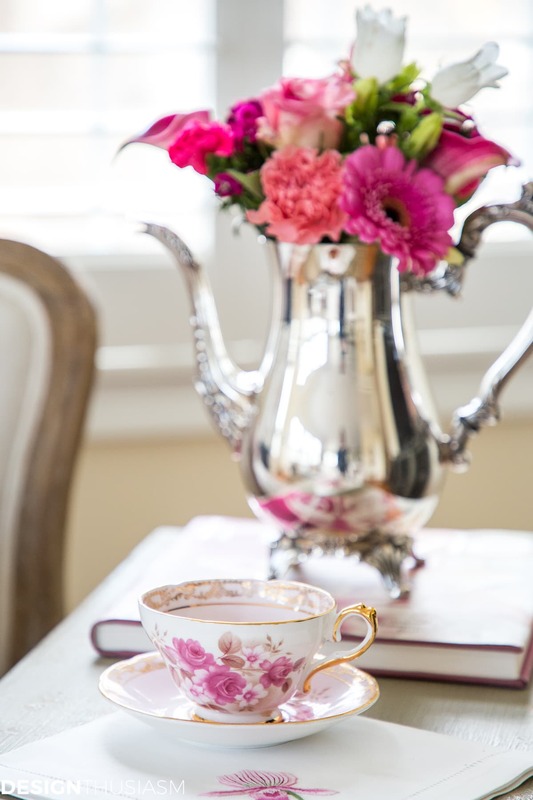 I love the teacup featured in this post. I did search on Ebay, but no luck. Could you provide me with the information on the bottom or the cup or saucer so I can research further? Thanks so much! Found the exact teacup on Ebay!! Thanks so much for your help!! I’m so glad! You’re welcome!! Lovely idea! I would be happy to have a pair of your cushions, I am sure it will complement the handmade cushions I bought from localbazaar.co.